BALTIMORE, April 26 – After two years away from the Octagon, former UFC welterweight Anthony “Rumble” Johnson didn’t just win in his return Saturday at the Baltimore Arena, but he showed off a new maturity to go along with his power and wrestling in defeating number four-ranked light heavyweight Phil Davis via unanimous decision in the UFC 172 co-main event. 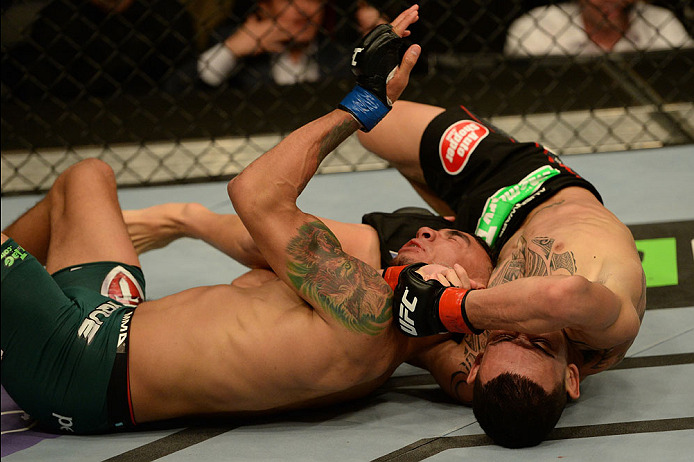 Scores were 30-27 across the board for Johnson in his first UFC bout since a 2012 loss to Vitor Belfort. His previous stint in the promotion was marked by weight issues, but since moving to 205 pounds, Johnson has started a new chapter in his career. Keeping the bad intentions on every strike, Johnson continued to have success in round two, yet Davis wasn’t going anywhere, matching his opponent’s steady aggression with his own strikes, producing some high-level action for the fans. In the final minute, another Davis takedown attempt came up short, adding to Johnson’s confidence level heading into the final round. Trying to make up for lost ground, Davis’ takedown attempts came more frequently in the third frame, but Johnson’s defense and right hand kept that from becoming a reality, capping off a stellar effort from the Georgia native, who is once again a player in the UFC. With the win, his seventh straight, Johnson improves to 17-4; Davis falls to 12-2. Former Strikeforce middleweight champion Luke Rockhold delivered one of the most dominant and impressive wins of his MMA career, submitting Tim Boetsch in the first round. 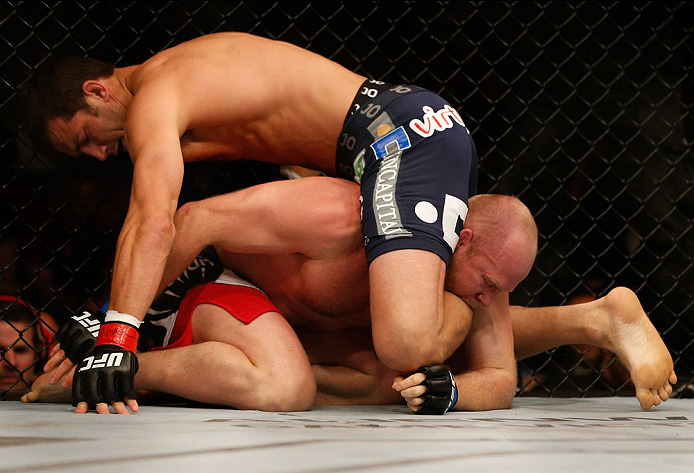 Boetsch looked for the takedown almost immediately, but Rockhold wasn’t about to surrender it, and as he sprawled out of trouble, he locked in a reverse triangle that snared Boetsch. The Pennsylvanian tried to get loose, but it was Rockhold locking on a kimura that produced a tap out at the 2:08 mark. With the win, Rockhold, who called for a rematch with Vitor Belfort or a fight with Michael Bisping, improves to 12-2. Boetsch drops to 17-7. New Jersey lightweight contender Jim Miller showed all facets of his mixed martial arts game in less than a round, and that’s all it took to submit late replacement Yancy Medeiros. Miller used his kicks a lot more liberally than in other fights, but it was a left to the body that really got Medeiros’ attention. Moments later, as the two locked up against the fence, it gave Miller the opening he needed for the finish, and he took it, sinking in a guillotine choke that put Medeiros out at 3:18 of the round. With the win, Miller improved to 24-4 with 1 NC; Medeiros, who moved from his own bout against Joe Ellenberger to replace the injured Bobby Green, falls to 9-2 with 1 NC. Rising featherweight star Max Holloway continued to show his maturity in the Octagon, overcoming a slow start to submit Andre Fili in the third and final round of the main card opener. The first round was fought at a frantic pace, with Fili the busier of the two, while Holloway’s shots were more accurate. When Fili did land though, he made an impression, and a late round takedown only helped his cause when it came to scoring the first five minutes. Holloway (9-3) jarred his foe early in the second, forcing the Californian to hold on, and the Hawaiian’s confidence only grew as he started to impose his will on Fili physically. With two minutes left, Fili did catch an off-balance Holloway and put him on his back, but a stalemate on the mat prompted a restart from referee Kevin Mulhall, allowing Holloway to again control the stand-up game. Intent on getting the fight to the mat, Fili (13-2) got his wish in the second minute of the final round. Holloway didn’t stay there long, and a hard right hand got Fili’s attention. It was moments later though that Holloway struck, landing several close range shots against the fence before catching his opponent’s neck during a takedown attempt. The guillotine choke finished the bout with a tap out at the 3:39 mark.